After a chilly start on Tuesday morning, most places will stay dry with some bright or sunny spells. 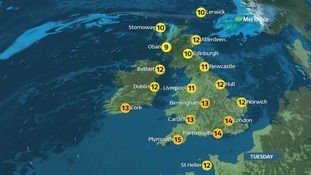 The best of the sunshine will be in the southwest and it will feel rather warm. Skies will be cloudy in northwest Scotland with patchy light rain and drizzle and brisk winds. Top temperature 15 Celsius (59 F).